This makes for an incredible looking figure. Can't wait for this. When is Ofelia coming out? I want Mr funny shoes! I suppose this may be unrealistic, but how cool would it be to get that stone pillar in the background for a display accessory? I want to know about the creepy fairy thing. Stop the overpriced fake-retro false-vintage trend! The pillar comes packaged with Ofelia along with three fairies a book and a key. BBTS has her listed as being released in the fourth quarter of 2018. Ofelia will come with the marker stone from the road, not the pillar from the center of the labyrinth. At Toy Fair or SDCC they said the center pillar and base would be sold as their own diorama. A variant of him painted blue like he appears in these images would be cool. I know that was due to lighting, but I feel like he looked blue in most of his appearances in the film. Ok guys, It has been a long time since I have watched this movie. Watched it once then never again, I think, and dont even remember much about it. BUT isnt it kind of weird that there is a strange goat man with his junk out chasing a little girl? There is a scene where they see a picture or statue of him and Oflia together with a baby. Then the shape of water with the woman and creature from the black lagoon. Am I the only one noticing trend here? I mean isn't it kinda weird? They may not be in my scale but these other details+news make me look forward for them. How much do these will go for, $24.99-ish? I wonder, will they release the Pale man before or after Ofelia and the set? There's nothing sexual between the Faun and Ofelia, he's just the one who gives her the tasks and the baby you mentioned is her little brother. Physically the Faun does very little besides shuffle around. On BBTS and EE each figure is $34.99. Pale Man is due first and should be out very soon. They didn't really show he had a willy-nilly in the movie, it was mostly covered up by shadows. The could have done it with the Pale Man but they didn't either. Shape of Water only really showed the woman's to convey her craving for intimacy. They baby has horns. Why would her brother have horns? I will have to rewatch this and get back to you. Lol. Anyway, I really like these diorama pieces. They will come together nicely when all of them are collected. Well played NECA. Inevitably you will have to get all the figures to have the entire diorama collection too. Last edited by Bearjew; 11-29-2018 at 08:43 PM..
To be fair I haven't seen the movie recently enough to exactly recall the visual you're describing. I could be confusing what you're describing with the center of the labyrinth which does depict Ofelia carrying her brother. 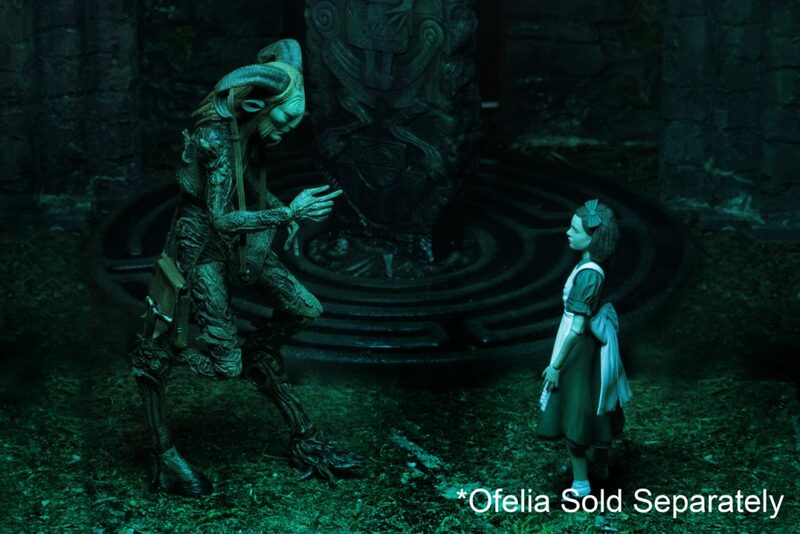 Anyone know how these Del Toro figures are selling? I have no real personal interest in any of them but I do appreciate the quality and the fact that NECA is tackling super-niche stuff like this. I'd like to see the line succeed because it might lead to NECA doing something else wacky that I might be into. Anyone know how these Del Toro figures are selling? I'm not sure anyone who doesn't have direct numbers of sales could really say. I haven't seen any Targets carrying the line so there's no physical reference and online impressions are likely a poor gauge because you're mainly going to hear from fans like myself who are hyped that this line happened at all. or a b-grade slasher/horror line.. Hoping McFarlane covers the super obscure horror characters in their Movie Maniacs V2! I was blown away with how well Pale Man came out. I've gone on before about how hyped I am for these but actually having the Pale Man in hand makes the hurt worse until I also have the Faun. The bar has been set high, I knew they'd look good but I wasn't prepared for how well Pale Man is actually constructed.